The Miele CarCare Accessory Case SCC 10 has been discontinued. 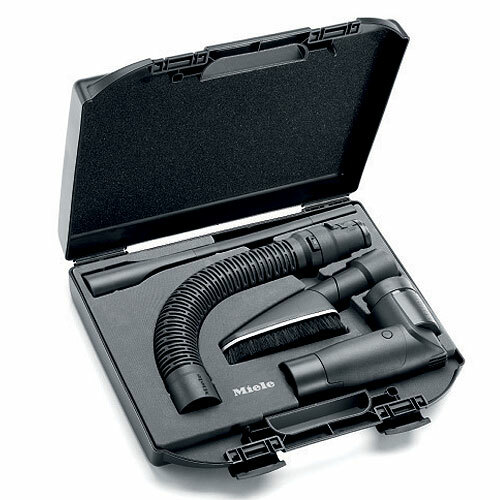 Miele CarCare Accessory Case SCC10 for quick and thorough cleaning of your car. Includes Suction Hose Extension (SFS10), Flexible Crevice Tool (SFD20) and Universal Brush (SUB20). This collection of genuine Miele vacuum cleaner accessories is ideal for quick and thorough cleaning of your car. Includes Suction Hose Extension (SFS10), Flexible Crevice Tool (SFD20) and Universal Brush (SUB20). Only fits non-electric vacuum models: S2121 Olympus and Capri, S6270 Onyx, Quartz and Red Velvet and S5281 Pisces. Suction Hose Extension (SFS 10): Excellent tool for cleaning stairs, car interiors or other areas that require a long reach from the vacuum. Expands up to 5 ft for an unmatched operating radius. For straight suction, non-electric canister vacuums. Flexible Crevice Tool (SFD 20 Short): Effortlessly reaches into and cleans awkward, narrow spaces, around furniture and appliances. This flexible crevice nozzle bends easily and cleans efficiently with a reach of 14 in. Flexible, Compact Hand Turbo brush (STB 20): Ideal for vacuuming cut-pile carpet and delicate upholstery, this tool can remove crumbs and pet hair from your furnishing and car seats with ease. Universal Brush (SUB 20): With soft bristles and a swiveling neck, this universal brush is perfect for cleaning dashboards and vents as well as moldings, bookshelves, mantles, and ceiling fans.